NEW Dell PowerVault MD1220 SAS Storage Array DUAL 6GBps Controller and Dual PSU's. 1 x Dell PowerVault MD1220 24-Bay 2.5 SAS Storage Array Chassis. 12 x Dell 600GB 15k 6GBps 2.5 hot plug drives. 12 x 2.5 drive bays free for future expansion. 2 x MD12 SAS 6GBps Port Controllers W307K. 2 x Power Supplies 0F884J. PowerVault MD1220 direct-attached, energy efficient storage array that provides the performance to satisfy demanding applications. Expansion for Performance-Intensive Single-Server Applications. PowerVault MD1220 direct-attached storage array is the second generation of Dell's energy-efficient, small-form-factor (SFF), 2.5-inch drive expansion enclosure. The PowerVault MD1220 offers seamless expansion for Dell PowerEdge servers with PERC H800 Host-RAID adapter, providing IOPs needed to satisfy performance-intensive application. This expansion array can support 24, 2.5-inch SAS hard-disk drives (HDDs) or solid-state drives (SSDs). In a 2U array and expands up to 8 arrays per adapter, so you dont have to trade capacity for performance. Optimizing performance, enhancing security while doubling the throughput. The PowerVault MD1220 leverages SAS 2.0 technology, which enables double the throughput over previous generation, with a 6Gb/s SAS interface and offers performance optimization with automatic I/O (input/output) load balancing across redundant paths and enhanced security, over previous generation with new self-encrypting drive (SED) support. The PowerVault MD1220 improves energy efficiency over previous generation, with new 80PLUS(R) Silver Certified power supplies. This enhancement augments the efficiencies already gained with 2.5-inch drives and variable speed fans. Satisfying Even the Most Performance-Hungry Applications. The PowerVault MD1220 direct-attached storage array storage array offers compelling performance. Pair the increased IOPs and throughput of 6Gb/s SAS with support for solid state drives (SSD), which have 3x the IOPs performance over 15K SAS. Drives and offer an ideal solution for applications that rely on random block access. Further optimizing the performance of the PowerVault MD1220, the PERC H800 Host-RAID adapter has automatic I/O balancing between the server and storage array. The PERC H800 can detect when a single path starts to get saturated and then balance the I/O traffic across both paths. The PowerVault MD1220 direct-attached storage array. Can deliver the speed, performance and reliability to satisfy performance intensive single server applications that store active and frequently changing information. The PowerVault MD1220 is a small-form-factor (SFF) expansion enclosure that helps manage power, heat and space consumption in your data center. In fact, 2.5-inch disks consume less power and 70% less space than 3.5 drives, and supports Fresh Air cooling (up to 35º Celsius). Additionally, the MD1220 power supplies are 80PLUS® Silver Certified, and, with variable-speed, temperature-controlled fans, are designed to deliver optimal performance and energy efficiency. Access and accuracy of your data are key to the success of any business. The PowerVault MD1220 has been engineered to help maximize your uptime and the security of your data. Redundant Path with I/O Load Balancing. You can rest assured that your data will be available when you need it. Even if a single cable path fails from one port of the PERC H800, you will continue to have access to your data through the second port. Self-encrypting drives help to ensure that your data is secure with drive-level encryption, so, even if a drive is removed from its storage system or the server it in which it is housed, the data on the drive is encrypted and rendered useless to anyone who attempts to access it without the appropriate security authorization. Additionally, SED supports instant secure erase of drives, which permanently removes data when repurposing or decommissioning drives. With hot-swappable drives, you can remove and replace drives even when your system is operating. No need to shut down, and no need to reboot: New drives are available right away. Leveraging the PERC H800 RAID Controller. The PowerVault MD1220 leverages the PERC H800 Host-RAID adapter with the latest PCI Express 2.0 interface, offering excellent performance for enterprise. The configuration of the PERC H800 Host-RAID adapter helps to increase reliability and fault tolerance by enabling the software to recognize the entire array as a single unit, regardless of how many disks are activated for storage in the array. With the PERC H800, customers can choose the RAID option that supports their application. The PERC H800 supports RAID levels 0, 1, 5, 6, 10, 50 and 60. Dell PowerVault MD1220 storage array is engineered to work optimally with Dell PowerEdge servers. Storage Manager Software can manage both the external array and internal storage within the server itself. The PowerVault MD1220 is supported behind the following servers: R210, T310, T410, R410, R510, R610, T610, R710, T710, R910, R810. See PERC H800 server compatability matrix for a list of currently supported servers. Streamlining storage management through a single, common interface helps reduce resource load on the system, and is easier to navigate for the user as well. The PowerVault MD1220 utilizing the same 2.5-inch drives as 11th Generation PowerEdge servers, and the same power supplies and fans as the PowerVault MD1200, helping to reduce the number of spares required. VAT IS NOT PAYABLE BY PURCHASERS OUTSIDE THE European Union (EU) AND by purchasers in the EU (excluding UK) who are VAT registered. 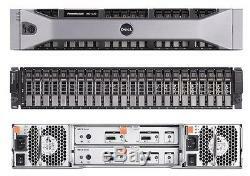 The item "NEW Dell PowerVault MD1220 SAS Storage Array 12x 600GB 15k 2.5 Dual Controllers" is in sale since Wednesday, February 21, 2018. This item is in the category "Computers/Tablets & Networking\Enterprise Networking, Servers\Servers, Clients & Terminals\Computer Servers". The seller is "itinstock" and is located in North London. This item can be shipped worldwide.